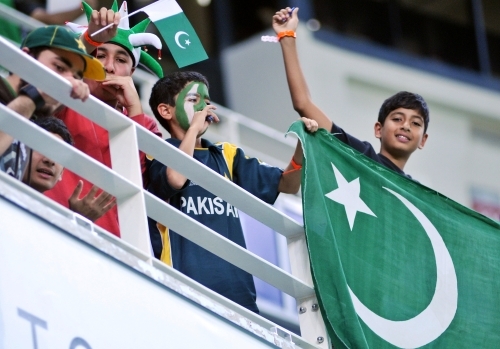 Abdul Razzaq produced a blistering innings of 46 not out from 18 balls as Pakistan squared the two-match Twenty20 series in dramatic style in Dubai. 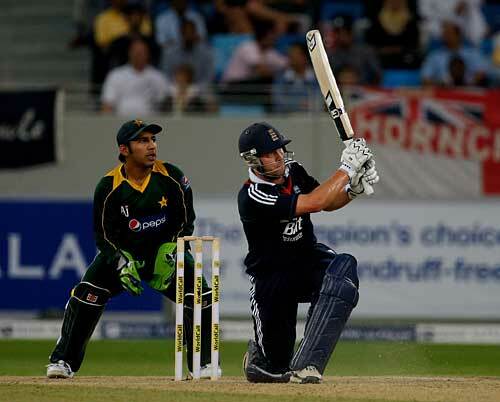 Defending a target of 148 following a timely return to form for Kevin Pietersen, England's bowlers looked to have the game in the bag as Pakistan slumped to 78 for 5 after 13 overs, following a two-wicket debut over from Ajmal Shahzad, and a brilliant spell of 4-1-14-3 from Graeme Swann. Razzaq, however, decided that aggression was the best route out of the hole that Pakistan had dug for themselves. After a solitary sighter, he launched Paul Collingwood over midwicket for six twice in two balls, and then repeated the dose one over later, as Luke Wright was battered into the long-off stands. With 44 runs required from the final five overs, the momentum of the match had suddenly turned, and Fawad Alam kept up the pressure by milking 13 runs from Stuart Broad's next over, including four consecutive twos, and a last-ball boundary as Shahzad on the edge of the circle muffed a half-chance for a diving catch. Three balls later, Fawad continued the onslaught by bludgeoning Tim Bresnan straight down the ground, and though he picked out Eoin Morgan on the midwicket boundary soon afterwards, he had helped add 48 match-changing runs in four overs. The equation was 18 runs from 12 balls when Shahzad was recalled to bowl the penultimate over of the innings, but Razzaq was ready for his bustling approach and slotted him into the long-off stands for his fourth six of the innings, before sealing the contest with his fifth and largest blow of the night, a mighty heave into the heavens. The game was done and dusted with a full over in hand, to give Pakistan their first victory in 11 outings in all internationals. Such a finale hadn't looked at all likely for much of the evening, not least when Shahzad - a late replacement for Ryan Sidebottom - was handed the ball to bowl the first over of England's innings. His first delivery was inauspicious, as Imran Nazir clunked him back over his head, but two balls later he had his revenge, as Nazir charged down the pitch to a short but straight delivery, and top-edged a wild smear into the hands of Bresnan at third man. Before the over was complete, Shahzad had claimed his second, as Imran Farhat flapped another loose pull, this time to Broad at mid-off, and at 4 for 2 after five deliveries, Pakistan were in some serious strife. 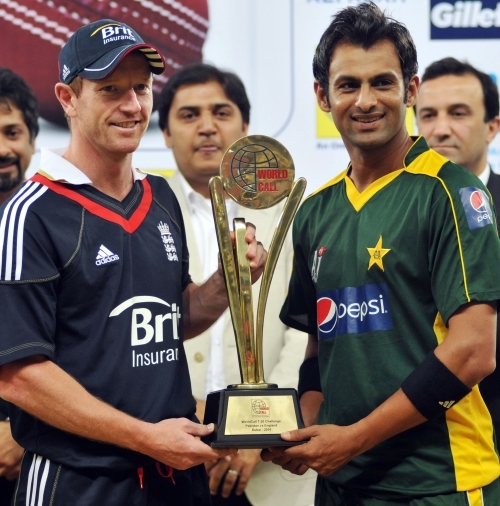 Though Shoaib Malik and Umar Akmal redressed the balance of the innings with an aggressive third-wicket stand of 36 in five overs, Swann suckered Malik with the first ball of his spell - a leg-side wide that resulted in a smart stumping from Prior - before Shahid Afridi and Akmal both launched ambitious hoicks into the hands of Morgan at midwicket. Once again, England found themselves unable to defend a total of less than 150 - they have never yet managed that feat in Twenty20 internationals. But it was far from a gloomy evening for their long-term prospects, not least because Pietersen confirmed that he is close to finding his best form. With Jonathan Trott providing solid support in a 98-run stand for the second wicket, Pietersen cracked four fours and three sixes - including one of the biggest hits of the week - to power England along to 148 for 6. It was blistering batting from Pietersen, whose confidence was sky-high after a measured 43 from 43 balls in Friday's opening contest. Whereas in that encounter he had been happy to play second-fiddle to an excellent performance from Morgan, this time he was ready to resume his more typical front-running approach. After a sighter from Arafat that fizzed past his leg stump for five wides, Pietersen got into his stride by advancing down the pitch to Razzaq to swing a lofted drive over wide mid-on. His next boundary had a modicum of good fortune as he threaded the gap between gully and backward point with a cramped cut shot, but his next shot in anger was one of pure class - a rifling drive off Saeed Ajmal, that rebounded off the steps of the second-tier hospitality boxes, and left one embarrassed spectator on his backside. The biggest let-down for England was the continuing poor form of Joe Denly, whose place at the top of the order is now in serious jeopardy following England's decision to call the big-hitting Craig Kieswetter into the one-day party for Bangladesh. Denly came into the contest with a total of 15 runs in his previous four Twenty20 innings, but he managed to add just five more runs to that tally from a further 10 deliveries, before Yasir Arafat nipped a good-length delivery back through his gate.